Now, if what I’m about to tell you is true, then this is a big deal, one of those awesome big deals that totally reinforces your belief that Auburn is the best at everything, the hometown of everything good… even—and somehow, deep down, like Leia, you always knew—Coca-Cola. You heard right: Coca-Cola. Coke. The Real Thing. Travel back with me if you will to the 1880s. Confederate veteran Dr. John Stith Pemberton is a pharmacist in Columbus, Ga. and dude is a morphine addict. (That’s what happens when you get slashed by a Yankee sabre a la The Patriot.) He decides he needs something to break his addiction. He invents Coke. Now, that’s obviously the yada yada yada version. But that’s the way it seems to go with Coke creationism. The story of Coke told by the internet is pretty patchwork, full of date discrepancies and self-referencing Wikipedia citations. But for the sake of this story—and until a Coke rep cares enough to dispute it—we’re going with the Coca-chronology presented in a 1975 Plainsman story, in which a respected, book-writing Auburn pharmacy professor straight up claims that the magic, primordial syrup that in the mid 1880s would become the blood of Coca-Cola, the stuff that gives that taste to the stuff that is now served 1.7 billion times each day, was first sold at a drugstore in Auburn. Which drugstore? The Plainsman understandably went with Toomer’s (because hey, if you’re going to link Coke and Auburn, link Coke and Auburn). “Toomer’s was the only drugstore in this location during the late 1800s,” Mac Lipscomb, then owner of the store—the Lipscomb family still technically own the property or something—told the Plainsman. He’s partly right. There was a drugstore inside the building that is now Toomer’s Drugs in the 1880s, just not Toomer’s Drugs, which openened in 1896, and until 1900 operated on the same side of College Street as its present location, but a few doors down. That’s when H. R. Bragaw sold his much older store (opened in 1865) and Lazarus and Toomer’s made their move. Lemonade, Coke, and Sloan’s Linament: THAT’S WHAT TURN OF THE CENTURY TOOMER’S DOES. That turn-of-the-century-ish photo of Toomer’s Corner? 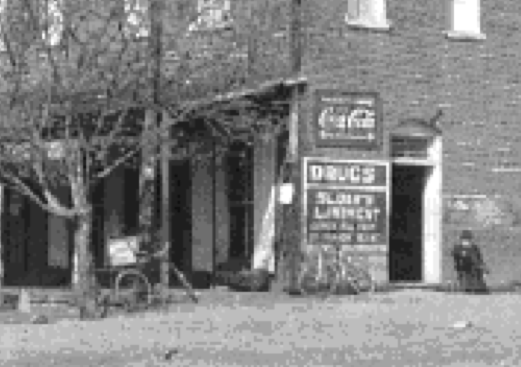 It doesn’t show the Toomer’s Oaks, but it does show a Coca-Cola sign on the side of whichever drug store at the corner it actually was at the time. But by then Pemberton’s cocaine-fueld “infant soothing” patent medicine elixir had already evolved into something close to the tasty tonic we know today. And hey—a Coke archivist who in the mid-90s spoke with Mickey Logue and Jack Simms for their revised pictorial history of Auburn actually found something stating that 237 gallons of soft drink-purposed Coke syrup was sold at Toomer’s in 1903. Two hundred and thirty-seven gallons? In a town of maybe 1,500 people drinking maybe 8 oz servings at a time? Yeah, I think it’s safe to say it’d been pretty popular for a while. But let’s back up—where did Hocking get the idea that the first purchase of Proto-Coke went down at “Toomer’s”? OK, but why Auburn? Weren’t there drugstores in Columbus, which is where he, you know, invented the stuff? 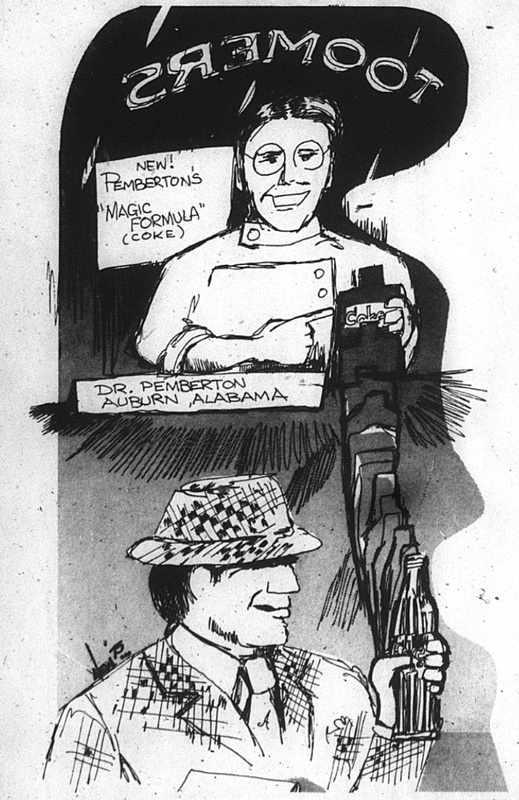 Not possibly came to Auburn, or could have come to Auburn—Doc Hocking is certain: Pemberton was in Auburn once upon a time and dropped some of this stuff off at an Auburn drugstore. And Hocking is certain because this Brannon guy was certain. Where there’s smoke, there’s Coke, people. War Eagle. Kind of like bama’s approach to the number of national championships they claim, if you say it often enough it becomes accepted as truth. I’m going with it. As if College and Magnolia in Auburn weren’t already legendary enough. Coca-Cola and Auburn. The Real Thing. While Auburn MAY have been ONE of the first places Coca-Cola was sold, according to the World of Coca-Cola’s tour (a reliable source), it was FIRST sold at a place called Jacob’s Pharmacy in Atlanta in 1886. We’re talking the pre-soft drink version, the pure syrup. I never leave home without a bottle of SLOAN’S LINAMENT OIL! Cures the common cold, scabes, good for brushing teeth, flavoring for your soup, add a drop to your nightcap to get a full nights sleep, and for curing restlessness. I also recomend SLOAN’S BEAR PAW POWDER, and SLOAN’S MERCURY PILLS for combating hair loss, gout, and sweatiness. I GUESS THAT’S THE REASON I LIKE COKES SO MUCH. LOL. well you know, there was, once upon a time, a Coke bottling plant in Tuskegee…just down the road. I can see the first syrupy kind being sold at Toomer’s. Auburn IS the Real ThAUng, after all!